Poor Scott Brown. The newly elected and clothing challenged US Senator from Massachusetts continues to put his foot in his mouth. Last Sunday he appeared on Face The Nation and said he plans to participate in a Republican filibuster of the financial regulatory rules as proposed by majority Democrats unless they are changed, but he has not offered any specific proposals. Then again, it is the modus operandi for the G.O.P. to demonize all things proposed by Democrats while failing to propose any specific alternatives of their own. Remember their non-existent health care reform legislation? Moreover, it appears that Brown simply fabricated an estimate of jobs that would be lost in Massachusetts if the Democrats’ regulations were enacted. The Boston Globe reports that Brown said that his weekend prediction on national TV Sunday that tightening Wall Street rules would kill 25,000 to 35,000 jobs in Massachusetts was “based on my speaking with industry leaders’’ in recent weeks, but he did not cite any specific analysis. A representative of Brown’s office said that Brown was given the estimate by the chief executive of MassMutual, a large insurance company headquartered in Springfield. MassMutual officials said Sunday, and again yesterday, that they did not give Brown any firm estimates of projected job losses in the Bay State. The company said it warned of unspecified job losses in the future and provided him with estimates — dramatically inflated estimates, the company acknowledged yesterday — of jobs lost thus far in the current recession. MassMutual officials said they had overcounted the losses in a way that nearly doubled the impact. I don’t see it either creating or destroying very many jobs, certainly not in numbers that are quantifiable. I’m no fan of this legislation. I kind of like Scott Brown. But . . . I don’t know where he comes up with numbers like that. No one has argued to us this is going to be cutting jobs as an overall in the economy. I have no idea where that figure came from. I don’t think anybody does. It may have just been spewed out by the Icelandic volcano with some of the other debris. Brown aides then said on Sunday that the figures were provided to him by Roger W. Crandell, the chief executive of Springfield-based MassMutual, during a meeting they had on Friday. MassMutual officials initially said they provided Brown with no such estimate. Yesterday, company officials explained that they had given Brown an estimate of how many jobs have been lost in the Massachusetts financial sector since the recession — which they told him was about 33,000 jobs — and said the current legislation could further exacerbate the problem. They did not however, provide Brown with any figure or an analysis of job loss. Senator Brown has now demonstrated that he will simply parrot the assertions of anybody that agrees with him without first checking the veracity of the allegation or the methodology of any analysis cited. 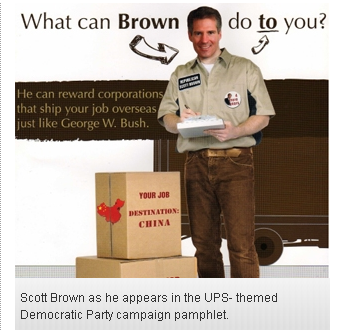 Like his Republican brethren, Scott Brown has revealed that he will utilize unsubstantiated fear as a means to oppose Democratic party initiatives. Perhaps like Sarah Palin, he too should pursue employment as a reality television show host. Maybe something called Republican Fear Factor. It appears however, that once again Brown’s vote may be as meaningless as his 41st vote against health care reform which he never had the opportunity to cast. Democrats state that it is likely that they will be able to gain bipartisan support from at least one of the following Republican Senators:Collins (ME), Snowe (ME), Corker (TN) or Shelby (AL). A vote from any one of them will prevent Brown’s threatened filibuster. If that happens, Scott Brown’s tenure to date will have been meaningless. Let’s hope it stays that way. Republican Senator Scott Brown relaxes in his office. Like Sarah Palin, newly elected Republican Massachusetts Senator Scott Brown seems to have a knack for injecting himself into every national news cycle despite the fact that he has had absolutely no effect on any policy or legislation since he took office in January. Indeed, the Tea Party’s newest poster child has only cast one Senate vote that has had any impact at all. That vote, to the dismay of conservatives, Republicans and Tea-Baggers all, was the vote he cast in favor of one of the Democratic majority’s job bills which in turn allowed Democrats to label the law as bipartisan. “Mr. 41” campaigned solely on the issue that he “would not be the 60th vote in favor of health care reform, but the 41st vote against it”. Unfortunately for Brown, he was outmaneuvered by the Democrats and he never had the opportunity to cast that 41st vote. This week the G.O.P. is using the clothing challenged Brown as the key person in their “Repeal and Replace” campaign against the recently enacted health care reform law. Brown’s Utopian dream is to repeal the enacted law and replace it with Republican alternatives such as cross-state insurance purchases and massive tort reform. The “Repeal and Replace” plan is a pipe dream at best, however. In order to effectuate such a plan, the Republicans would require massive majorities in both the House and Senate so as to pass their repeal. Remember, the G.O.P. has stated publicly while obstructing progress, that the new norm is to have 60 votes to pass legislation in the Senate. That would mean that they would have to pick up 19 Senate seats in the 2010 midterm elections in order to avoid the Democratic party filibuster. They are sure to pick up seats, but not 19. Moreover, even if they managed to acquire a 60 seat Senate majority, their repeal law would surely be vetoed by President Obama. Thereafter, in order to override the veto, the Republicans would require 67 Senate votes. So G.O.P. as Tony Soprano would say, “Fagetta Bout it”. Getting back to Scott Brown, it was interesting to note that his name surfaced on both Face The Nation and Meet The Press on Easter Sunday morn. On both shows he was touted as the new star of the Republican/Tea-Party. In each instance he was also deemed as surpassing Sarah Palin in terms of both credibility and effectiveness. Palin was denigrated by the pundits for both her lack of standing inasmuch as she holds no elective office and for a lack of seriousness resulting from her new reality show status. Indeed, Sarah Palin has morphed into exactly the type of Paris Hilton/Britney Spears no-substance, lightweight celebrity that she and John McCain once accused Barack Obama of being. The pundits all agreed however, that it would not be surprising to see Scott Brown as the next Republican nominee for Vice President. Let’s hope he is. The Democrats and bloggers would have a blast repeatedly posting the now infamous naked centerfold spread. The Palinistas must be apoplectic at the moment. That pesky mainstream media has finally exposed Sarah Palin as the dishonest, conniving, plain stupid, schizophrenic fool that she is. And what better program to drive the stake into the blood-sucking former ex-quitting governor of Alaska than the award winning 60 Minutes and during prime-time to boot? Ouch, that is going to leave a very visible mark! As everyone certainly knows by now, last night’s show featured a segment during which former John McCain Campaign Manager Steve Schmidt simply eviscerated Palin. It is always entertaining to watch Republicans eat their own, but this was particularly delicious because Schmidt actually had full insider access to Palin and her multiple idiosyncrasies for the entire time that she was part of the failed presidential ticket. He witnessed her bewildering and perplexing behavior on a daily basis. Consequently, he knows that portion of Palin’s life better than any other person not related to her and possibly better than some of them also, too. The segment also included unflattering revelations about Palin from the authors of the soon to be released (and fact checked) Game Change, Mark Halperin and John Heinemann. Mark Halperin said that even after crash-course tutorials by campaign aides following the convention, Palin was still woefully uninformed about basic policy issues. [S]he still didn’t really understand why there was a North Korea and a South Korea. She was still regularly saying that Saddam Hussein had been behind 9/11. Steve Schmidt added that she hurt herself in the now-infamous interview with CBS’s Katie Couric by not adequately preparing and letting herself be distracted by what the authors describe as an obsession about her political standing in Alaska. She went out and said, you know, ‘This report completely exonerates me,’” Schmidt said. “And in fact, it – it didn’t. You know it’s the equivalent of saying down is up and up is down. It was provably, demonstrably untrue. 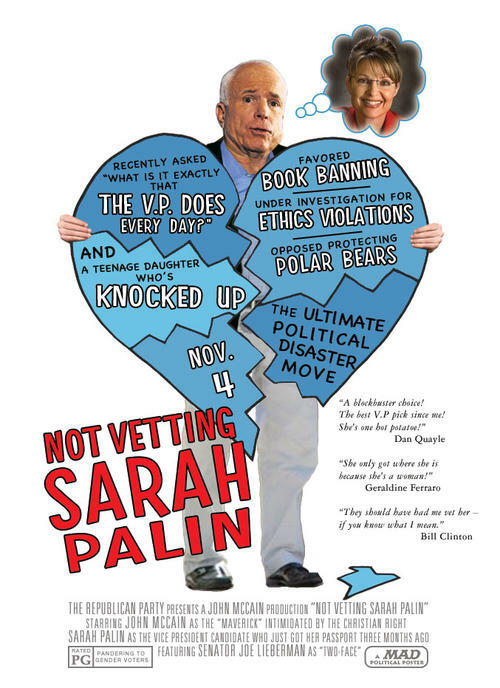 Schmidt also said that Palin unsuccessfully lobbied the McCain campaign to state that her husband Todd was never a member of the Alaska Independence Party. That political party has a platform plank that calls for the State of Alaska to secede from the United States. The truth however, was that Todd was a registered member of that party for some years. That alone shines a peculiar light upon Todd and the rest of the Palin’s when they wear those “If you don’t like America…Then get the hell out” t-shirts. 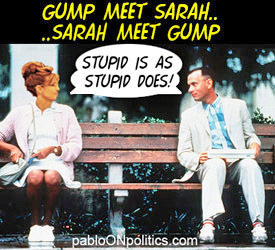 As is her usual response, Sarah Palin refused to be interviewed for the 60 Minutes program. That was to be expected however, when one considers how poorly she performs when questioned by true news outlets with unscripted questions. After all, she has never appeared on any of the serious Sunday morning talking head programs such as Meet The Press, Face The Nation or This Week. She’s an Alaskan “Mama Bear” alright !